The brand evolves its "Share a Coke" campaign by offering summery Spotify playlists through unique labels. Coca-Cola Canada is taking a musically-inspired approach to evolving this year’s “Share a Coke” campaign. This summer, Coca-Cola fountain cups and 500ml bottles of Coca-Cola, Diet Coke and Coca-Cola Zero will have 185 different musical phrases and “summer moments” – like “Summer Jams,” “Road Trip,” and “Throwback” – added to their labels in a fashion similar to its hugely popular personalized bottles. 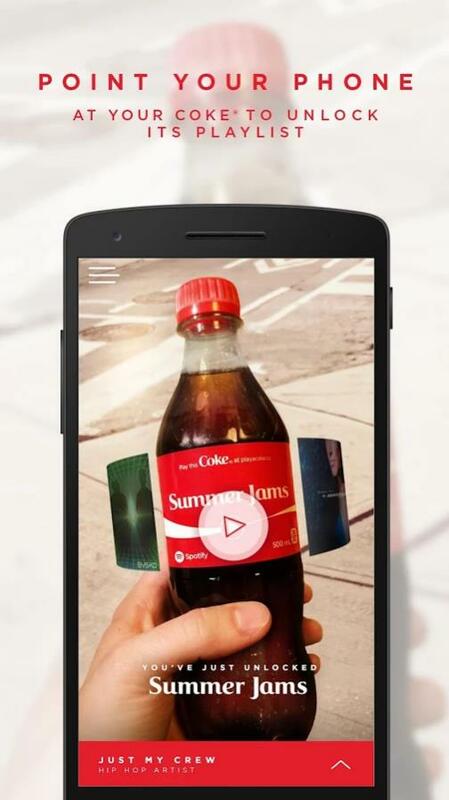 Through the new “Play a Coke” app, users can scan their Coke to unlock a Spotify playlist specific to the moment. The app also allows users to play, pause and skip through songs in the playlist by turning their bottle or cup. The app and campaign was developed specifically for the Canadian market, and will feature experiential activations, online paid media, a social push and in-store marketing as the summer rolls on. The campaign will also include limited releases of Vanilla and Cherry Coke, two varieties the company says are the most-requested among Canadian consumers. The second phase of the campaign will launch in July, featuring the release of more “moments” on bottles. The extensive list of Canadian agencies on the program includes The Hive on the creative concept and development of the “Play a Coke” app; UM on media buying; Mosaic on experiential; Hill + Knowlton on PR and influencer relations; Perennial on packaging design; and Ogilvy & Mather handling digital, social and adaptation of creative from other markets that will be utilized for the campaign. Though this particular execution is exclusive to Canada, the program is an extension of the global “Taste The Feeling” platform, launched earlier this year as part of the company’s “one brand” strategic shift that saw marketing of all Coca-Cola brands organized under a single campaign. Music appears to be a focus across markets this summer: in the U.S., the “Share a Coke and a Song” campaign is taking the lyrics from 70 iconic songs and incorporating them into the packaging across its products.